A Warre honeybee hive you can build this weekend! The conventional hive we see in commercial beekeeping is the Langstroth hive. Some beekeepers do just fine with their Langstroths. But for others, this type of hive is believed to be stressful to the bees, to be very high maintenance, and tough on back muscles of the bees’ human stewards. The queen is often restricted from certain locations, bees are forced to build honeycombs in unnatural square shapes, and there is less room for bees to move around. The Warre beehive alternative is a specific type of “top-bar” hive based on an ancient and very practical design -- with some newer special advantages. It’s very easy to build and use, and can cost as low as one quarter of the price of a conventional hive. 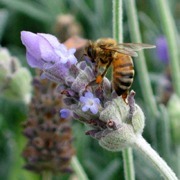 Plus, the bees love it and their health improves in these hives. The top-bar hive in general is believed to be thousands of years old and most likely invented in Africa. There is a Kenyan version and a Tanzanian version, explaining why top-bar hives are also sometimes called African hives or Kenyan hives. In the earliest versions, beekeepers gathered or cut appropriately sized sticks to use as the bars to lay over open-topped woven baskets. To harvest some honey, they’d just lift one of the sticks, harvest what they needed, and set the stick back into place. Modern beekeepers who use variations of top-bar hives in temperate climates build hive containers other than open baskets to better help the hive remain dry and safe from temperate weather. 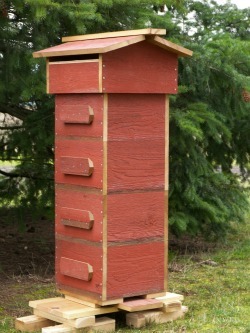 People today sometimes create versions of a “horizontal top-bar hive” by, for example, using clean 50-gallon drums mounted sideways and affixed with bars across the top of the drum which has been sawed away. 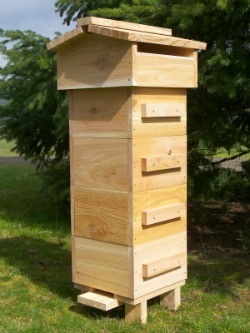 The Warre hive is also sometimes called the "vertical top-bar hive." It's named after Emile Warré who invented it in France in the early 20th century. It is bottomless and uses bars (slats of wood) for the bees to build their comb. Bees aren’t forced to build combs in unnatural squares. Instead they can follow their instincts and build beautiful, naturally shaped combs vertically down from the bars. Queens aren’t as restricted to certain chambers and the bees can move around as they’re programmed to without tight quarters. It’s considered a type of hive bees enjoy living in, allowing them to follow more of their natural instincts. And, it’s much more of a hands-off method for beekeeping compared to conventional hives. Warre hives are easy to build yourself with simple materials. Mr. Warré put much into the development of this hive. He wanted to create something economical, simple and bee-friendly that all people could succeed with, and therefore, his hive was sometimes called the People’s Hive. But it has been noted that very similar hives appear to have been independently created in other areas of the world, including Germany and Japan. Type of wood for building your own: Bees are observed to choose old or weathered wood over fresh-cut wood. Recycled timber can work better than new wood as long as it hasn’t been chemically treated. The photo above of the red hive is made of recycled barn wood. There are favored types of wood to use for hives including Western red cedar which doesn’t need paint or other measures to withstand weather. Other cedars, cypress and Douglas fir also work, but oak can warp easily plus is very heavy, and elm rots quite easily.